Toddlers love to dress up, and most of them also love dinosaurs. So, what better combination than getting them a dinosaur dressing up costume?! There are so many different costumes to choose from, in a variety of colors and each depicting a different type of dinosaur. So, we are here to help with these reviews of some of the best dinosaur costumes for toddlers. You will find onesies, tutus and even inflatable costumes here – there is something for everyone! 1.20.1 What are the Different Styles of Dinosaur Costume? 1.20.2 What are the Benefits of Dressing Up for Toddlers? 1.20.3 When Can My Child Wear Their Costume? The first thing to think about is the type of dinosaur your child likes the best. Many love the ferocious T Rex, so in this case it makes sense to choose a toddler T Rex costume. For dinosaur-loving girls, they might prefer a nice pink dinosaur costume! Also think about when the costume will be worn, and as a result which materials it is made from. Thick, fleece onesies are ideal for when your toddler is going trick or treating as a dinosaur and you live in a cooler area. For warmer climates, or if your child is going to a costume party, thinner materials might be preferable. Toddlers can get quite warm when they’re running around at a birthday party! Of course, the size should also be checked before buying. Many costumes use the same sizing chart as clothing, so it’s easy to figure out which will fit. In some cases, you might need to measure your child’s height in order to find the perfect fit. Now, let’s take a look at some of the dinosaur costumes for toddlers which are available on the market today. With almost 20 costumes to choose from, there is something for everyone here. 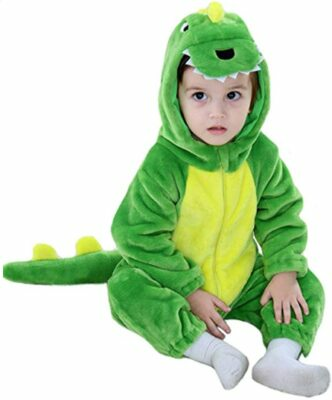 This toddler dino costume is made from plush fleece which is both comfortable and warm. It’s ideal for wearing as pajamas or for trick or treating in colder weather – it’s loose enough to wear layers underneath to keep extra cozy. Kids will love the details on the costume, including the spines down the back, the teeth and eyes on the hood and of course the dinosaur’s tail at the back. Toddlers will love the handy pockets on this onesie, and the hood to keep them nice and warm. It comes in two sizes, 2T-4T and 4-6. The onesie is fastened by a zipper, so it’s easy to put on and take off quickly. This toddler costume is made from flannel and cotton for the ultimate in comfort. It’s also breathable to help prevent your little one from becoming too warm. The material is super-soft, and can be machine washed many times without losing its shape or otherwise becoming damaged. It comes in many sizes from 0 – 36 months, so there is something to fit everyone. The onesie can be used for many occasions, including fancy dress parties, pajamas and simply playing at home. The facial details are securely attached so there is no danger of them coming off and becoming a choking hazard. Also, the stitching is strong and secure on the costume, and the zipper is well-attached. It also opens enough to make sure putting the costume on and getting it off is really quick and easy. This dinosaur outfit for toddler is perfect for wearing at Halloween – people might even be fooled into thinking your toddler is a real dinosaur! The costume is nicely detailed with scales and spins, and it also has hand and foot coverings resembling claws. Polyester is used in making this costume, so it’s comfortable and durable. There are two different colors available and several sizes to fit toddlers and children of all ages. Kids will be the talk of their Halloween party with this great costume! This kids dinosaur costume is easy to put on – it can simply be worn much like a jumper, over a t-shirt. This is great for fussy toddlers who hate to get dressed! It’s made from soft and durable polyester, and has a simple Velcro closure. One size fits all with this costume – from the age of around 3 to 6 years. The costume is comfortable to wear, and it’s ideal if your child doesn’t want a full costume such as a onesie. Kids will love the cute tail and the spines on the hood! 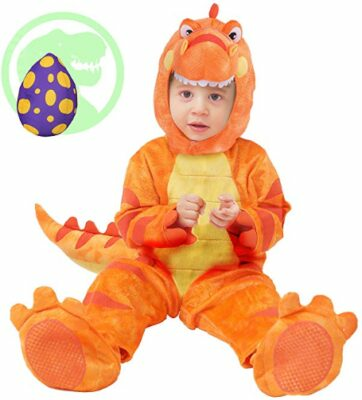 This toddler t rex costume comes in a cute orange color, making it stand out from the usual green costumes. It also features shoe covers for added warmth and a cute face on the hood. You will also receive a plush egg bundled together with this costume, so your child will look adorable posing in photos. The suit comes in two sizes, to fit 12 – 18 and 18 – 24 months. It’s also loose enough to layer up with extra clothes underneath if needed. The costume is fastened with snaps underneath, making diaper changes easier than ever. This toddler triceratops costume is perfect for kids who prefer the triceratops over the T Rex and is sure to help them stand out from the crowd! It’s made by Rubie’s, a well-known costume manufacturer whose costumes are always high-quality and comfortable. This one is made from polyester and comes in two pieces – the bodysuit with enclosed feet and the headpiece with horns and crest. This toddler inflatable dinosaur pick will ensure your child is transformed into a true dinosaur! It looks incredible, yet is not too difficult to use.First, assemble the fan and clip the battery pack onto the clothing worn under the costume. Then, simply put the costume on an tighten the hood around the face to ensure a snug fit before turning on the fan and watching as the costume inflates. This is a great costume for parties – your toddler will look and feel awesome in it! However, it is probably not as comfortable as a fleece onesie, and your child will be unlikely to wear it when playing around the house. As above, this costume is made by Rubie’s and is also licensed by Jurassic World, so you can be sure it is of the highest quality. This toddler pterodactyl costume is an excellent choice for those looking for something a little different from the usual T Rex costumes. It comes in the shape of a pterodactyl, complete with wings attached to the sleeves and a head on top of the hood. It also comes with shoe covers and finger loops to hold the sleeves down, to completely transform your child into character! There are two sizes available – 3T-4T or 4T-6T, so it’s great for toddlers of all sizes. They will love to wear this costume on Halloween, to costume parties or even just playing at home. The costume is based on the character Tiny from Dinosaur Train, so it’s sure to be a hit with those who love watching the program. 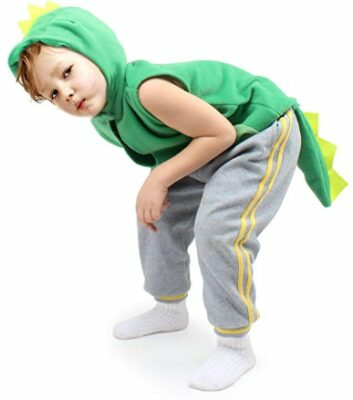 This toddler boy dinosaur costume comes in a choice of three colors – blue, orange and green. There is also a choice of sizes, either 2T-4T or 4-6. The costumes have a good attention to detail, with scales, claws and teeth – kids will love this! There is also a tail on the back, a headpiece with a face and teeth, and gloves to really complete the look. The costume is made from polyester and is easy to put on over other clothes, or can be worn alone. This dinosaur Halloween costume for toddler is funny and unique and is sure to make them the talking point of the party. It’s made from polyester and is stuffed with polyurethane foam, and is intended to fit ages 3 – 6 years old. The leopart-print shirt is attached to the costume, however the club pictured is not included. So, if you really want to complete the caveman look, you will have to purchase this separately. This 2t dinosaur costume comes in two pieces, which makes it easy to put on and take off, and also allows for easy diaper changes or trips to the bathroom. The trousers have an elasticated waist for ease of use and comfort, and the hoodie has a zipper on the front, as well as an elasticated hood. There are cute spines on the back and hood, as well as a tail attached to the back of the hoodie. Parents will love the fact that the costume is machine washable, and also comes in smaller sizes to fit younger toddlers. This inflatable t rex costume for kids is intended to fit ages 2 – 5 years old, and comes with everything you see in the picture, including the hat. All you need to add is 4 AA batteries for the fan. Matching costumes are available for adults – excellent for a Halloween fancy dress party, everyone will love to see a matching family of dinosaur riders! The fan needs to run constantly when the costume is being worn, and it is fastened by pulling the cord tightly around the waist. This is perhaps more comfortable than our other inflatable costume above which needs to be fastened around the head. 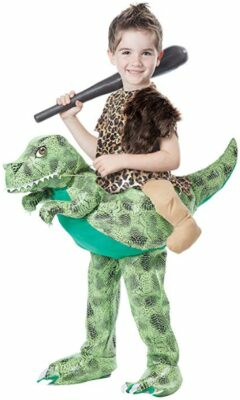 This toddler raptor costume comes with shoe covers, a hood and attached gloves – so your child can completely transform into a raptor from head to toe. It’s made from polyester and comes in two sizes. The eyes are plastic, and there is a zipper on the back of the costume, so toddlers will probably need a little help to put it on and take it off. Toddlers will love the details such as the claws and stripes and of course the ferocious teeth! These dinosaur tails are excellent for transforming any outfit into a dinosaur costume. They come as a pack of three in different colors, as pictured here. However, there is also the option to have one tail and other accessories such as a bow tie and a headband instead. The size is intended to fit most children aged around 4 years old and above, so kids will have years of enjoyment from this costume. The tails are great for using at parties or playdates – toddlers will love to share them with their friends and make up fun imaginative games with them! This 3t dinosaur costume is made by well-known manufacturer California Costumes, so you can rest assured it is made from the best quality materials. Everything you see here is included, the bodysuit, hood, wings, tail and shoe covers. The costume is made from polyester, and is easily pulled on over other clothes or can be worn alone. There is a piece of Velcro on the back to attach the wings, whilst the tail is already part of the costume. This t rex halloween costume for a toddler is an excellent choice for girly girls who also love dinosaurs! It can fit sizes as small as 6 months, and is made from polyester. Unfortunately, this costume can be hand washed only, as it is too delicate to go in the washing machine. The hood is separate from the body and there are also shoe covers, so your child can pick and choose which pieces they wish to wear. Toddlers will love the textured fabric on this costume, as well as the cute, goofy face on the hood! The pink polka dots and spines are also sure to make this costume a hit with the youngsters. 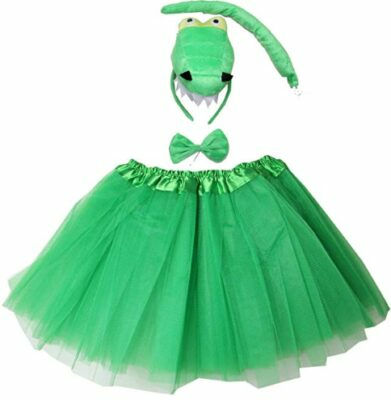 This toddler girl dinosaur costume is a bit different from the rest, as it takes the form of a tutu rather than a onesie. So, this is sure to be a hit with little princesses! It comes with the skirt, a tail, a bow tie and a headband with the dinosaur’s head attached. The costume comes in a range of designs featuring all different animals, so you could even start a collection! One size fits most with this costume – it’s designed to fit kids aged between 2 – 7 years old on average. It’s made from polyester and is easy to put on and take off – it can easily be worn over any other outfit. 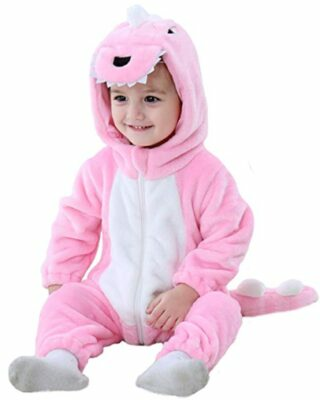 This cute toddler pink dinosaur costume has a flannel lining for warmth and a cotton exterior. The material is soft and breathable, and so is comfortable to wear for any length of time. Little girls will love to wear this out at Halloween or for simply relaxing around the home – it is perfect for all occasions. After a busy day playing, the costume can simply be washed in the washing machine, taking the hard work out for parents. This toddler dinosaur costume 2t is great for girls who love pink and love dinosaurs! There is a zipper on the front for easy fastening, and the tail is stuffed to ensure it looks great. The costume is made from polyester velour which is comfortable and soft, so kids will love to wear it. There are hands and feet attached to the costume, and the spines all down the back and tail make this costume look incredible! There are so many great costumes to choose from, picking the best is a near-impossible task! The one to choose really depends on your child’s likes and dislikes and the occasion for which the costume is required. However, a great all rounder is the T Rex Costume with Hood, which is number 3 on our list above. It looks stylish and detailed, is easy to put on and take off and is made from good-quality material which will last well. A great choice for boys and girls alike! What are the Different Styles of Dinosaur Costume? As you can see above, there are a few different styles of costume available. There are soft, fleece onesies which are great for wearing to relax at home, or for going out in cold weather. 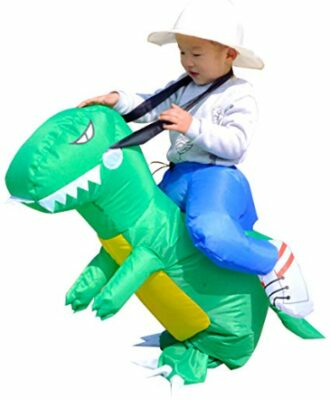 You can also find inflatable costumes or those which make your child look like they are riding a dinosaur! You can find T Rex costumes, raptor costumes and everything else in between, so no matter which dinosaur is your toddler’s favorite, you are sure to find the perfect costume. There are all different colors available too, even pink for little dinosaur-loving girls! What are the Benefits of Dressing Up for Toddlers? Dressing up is really important for young children for many reasons. Role playing can help youngsters learn to feel empathy and can also help with problem solving skills. Language skills can also be developed when playing dress up, as kids talk about what they are doing and how their character feels. Of course, a major benefit of dressing up is letting kids exercise their imagination. They can become anything they want with a simple costume and some props! When Can My Child Wear Their Costume? Toddlers don’t need a special occasion to play dress up – they are quite happy to play in their costumes at home! They will love to make up imaginative games in the house or the backyard, and they might even want to wear their costume to bed! Fancy dress parties are also popular with toddlers, so if they are invited to one they can certainly go as a dinosaur. Or, why not host a costume party for your toddler’s next birthday? Halloween is another popular time of year for toddlers to dress as dinosaurs. They will be the talk of the town with one of these great costumes!